A very attractive and exotic looking ornamental foliage plant that joined our tropical garden, sometime late 2005. Another love at first sight plant! 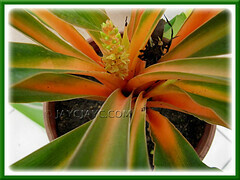 The vibrant orangy-hued petioles set against the contrasting medium green leaves make it so appealing and interesting. Chlorophytum ‘Fire Flash’ will make an excellent ornamental plant, be it indoors or outdoors alike. A glowing beauty indeed! Plant type: Perennial foliage plant, native to the rainforests of East Africa in the Usambara Mountains of Tanzania. 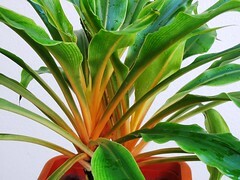 Features: Chlorophytum amaniense is one of the 200-220 species in the genus Chlorophytum, and ‘Fire Flash’ is the only recognized cultivar in this species. An evergreen perennial plant, popularly grown for its ornamental foliage that will mature to a height of 45-60 cm, a little shorter if container-grown. It bears medium green and glossy leaves that are ovate-lanceolate in shape with pointed tips and undulate margins. Leaves, measuring 25-30cm long and 5-10cm wide, are rubbery yet brittle, and grow in an open rosette habit. In fabulous contrast with the medium green foliage is the stunning orangy (coral) hues of the petioles and leaf midribs, that appear to be glowing centrally beneath, hence aptly named ‘Fire Flash’. It produces small white flowers along a cylindrical panicle rising from the middle of the plant, lasting about a week and subsequently transform into seed pods. Like its distant relative, the Chlorophytum comosum, it has tiny swollen nodules in its root system to store water. It has a tendency to produce aerial roots too. 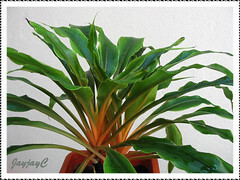 Culture (Care): Chlorophytum amaniense is one of the easiest houseplant or outdoor plant to grow, needing little attention. Light: Filtered/dappled sunlight or moderately low light to full shade. Keep well away from direct sun or intense light levels that will cause leaf chlorosis or scorching. Moisture: Require adequate water regularly, If possible, use soft, tepid water or rain water to avoid browning foliage caused by flouridated water. Soil should be kept fairly moist but not overwatered. Quite drought tolerant as its root system consists of swollen water-storing nodules. Given its native habitat, it loves humid environment. Soil: Any humus or organic-enriched potting mix that holds moisture, yet well-drained. Others: Foliage is extremely sensitive to high light levels, chemicals, pesticides and insecticides, so avoid these. If not using its seed pods for propagation, remove the insignificant inflorescence once it appears, to conserve energy for better foliage production. Keep plant groomed by removing withering or yellow leaves and if its stem become leggy over the years, just cut off the top crown that includes the rosette of leaves and replant in fresh potting media to rejuvenate it. Then, take a few cuttings from the lower stem for propagation. During hot and dry weather, increase humidity to prevent browning of leaf tips/margins by misting regularly or stand the pot on a shallow tray of pebbles filled with water to just below the base of the pot. Occasionally, wipe off the dust that settle on leaves to keep it healthy and shiny. Feed once monthly with a liquid fertilizer for foliage plants at half-strength, onto soil and never on the foliage as leaves are extremely sensitive to chemicals. It is relatively trouble-free from disease and pests. For temperate zones: Hardiness: USDA Zone 9-11. Check info at Dave’s Garden. Propagation: By viable seeds, germinated in moist potting mix with warm temperatures of 70-85 degrees F or allow the plant to self-sow which it does prolifically. Read more about seed germination here. Can also be propagated from herbaceous stem cuttings that root easily in soil or by removal of basal shoots that are sometimes produced – gently separate them from the parent plant and grow individually. Usage: Fire Flash make excellent outdoor shade plant in mixed beds, as a ground cover or front-of-border perennials or below shaded trees or shrubs. Great for container gardening. 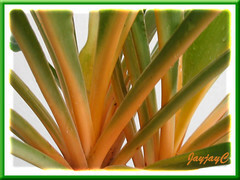 Indoors, due to its great tolerance for low light conditions and resistance to disease, it is most ideal as houseplants in homes and greenhouses, or used for interiorscape in offices, hotels and shopping malls. with an inconspicuous flowering spike. Enjoy! Can you pleass help me find out what this plant is called in the Philippines. I just need it for my research study, your help will mean so much. Thank you for the help.